By studying the genes of honeybees, scientists may one day better comprehend the diseases and viruses that affect them, specifically how their genes resist. 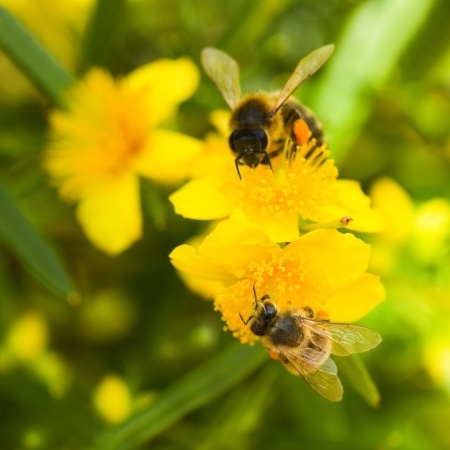 “In the past decade, honeybee populations have experienced severe and persistent losses across the Northern Hemisphere, mainly due to the effects of pathogens, such as fungi and viruses,” says Vincent Doublet, a University of Exeter postdoctoral research fellow. Finding a specific set of genes involved in disease and virus resistance can also help scientists and apiarists breed more stress resilient honeybees. Honeybees, originally thought to have different responses to different diseases, tend to rely on a core set of genes in response to any pathogen, according to Robert Paxton, professor of zoology at the German Centre for Integrative Biodiversity Research. DNA sequencing advances have encouraged investigations regarding honeybees’ response to certain pathogens. There have been studies in the past, and the data has been overwhelming, revealing unpredictable patterns within the bee population. According to Christina Grozinger, a Penn State entomology professor, it’s been difficult to find a common denominator. There doesn’t seem to be any specific genes or pathways that can help bees gain resilience. Grozinger’s team created a tool that enabled them to incorporate information from 19 various datasets, with the goal being to establish the genes that affect how honeybees respond to diseases. In the process of their creation, the team invented a new technique — directed rank-product analysis. This allowed the researchers to establish the genes that were affected similarly across the datasets as opposed to only the genes that were most affected. These results, published by BMC Genomics, revealed that the genes responsible for encoding proteins were affected similarly to the genes that encode enzymes. These findings may help more than just honeybees, applying to other insects as well. The core genes in this study have upheld through evolution, and they are shared among a vast group of insects. This can provide key knowledge about the interactions of pathogens with bumblebees, pests, aphids, and moths. From this analysis, the list of genes could one day help to breed more disease resistant bees and other key insects as well.